The 1920's felt cloche hat is great for completing your 1920's period costume or as the finishing touch to your flapper costume. The cloche hat is a classic shape for females that is sure to flatter almost any face. 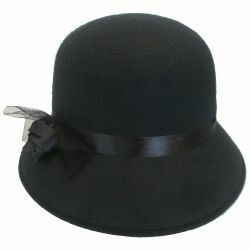 The 1920's felt cloche hat is available in black and features a ribbon band with fabric and lace rose accent. This hat will fit a head measurement of up to 22.5".